Journal of the House of Lords: Volume 10, 1648-1649. Originally published by His Majesty's Stationery Office, London, 1767-1830. DIE Veneris, 17 die Martii. L. Broghill's Ordinance to be Master of the Ordnance in Ireland. Lady Borlace's Petition, for Money for her Husband's Funeral. Message to the H. C. with it; and about the following Particulars. E. of Worcester's Daughters Petition, for a Maintenance. Sir J. Brook's Claim to the Barony of Cobham. Fr. Ambassador desires a Ship from St. Malo's may be released, that is at Tenby. Bridges to be instituted to S. Croxton. Message from the H. C. with Ordinances; and to appoint a Time for swearing the Commissioners of the Great Seal. Commissioners of the Great Seal sworn. Tuckney to be Margaret Professor at Cambridge. Message from the H. C. with Orders and an Ordinance. March, E. of Arundel's Servant, Privilege. Additional Ordinance concerning the Sale of Bishops Lands. Ordinance to remove Obstructions in the Sale of them. Order for a Pardon for Han. Terrent. Passed the H. C. 15 Inst. Ordinance appointing Commissioners of the Great Seal. Passed H. C. 15 Instant. 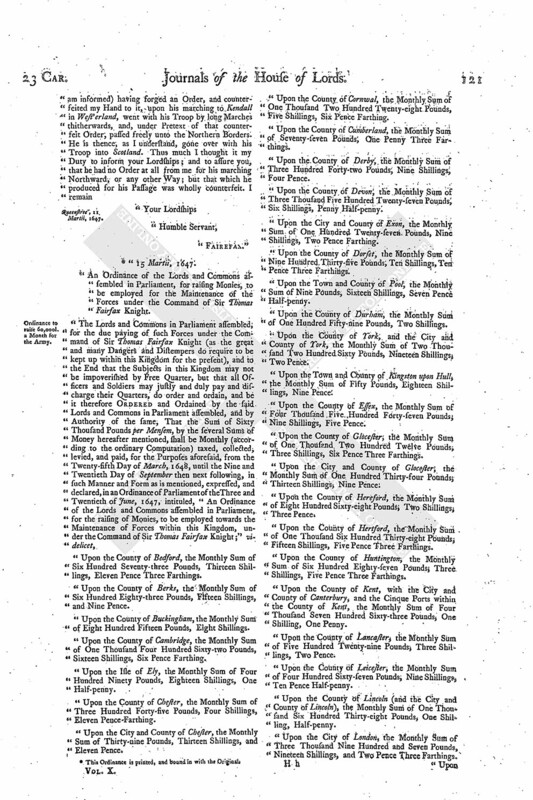 Ordinance for Exportation of Wool to Guernsey. Sir Gilbert Gherrard to be Chancellor of the Dutchy of Lancaster. Two of the Commissioners of the Great Seal to act. Salway restored to the Place of King's Remembrancer. Order concerning the Mariners Wages of the Ship Sun. Order for 2000l. for L. Broghill, in Part of his Arrears. Additional Ordinance for better raising 8000l. per Ann. settled on the P. Elector. Ordinance to remove Obstructions in the Sale of Bishops Lands. Additional Instructions to the Commissioners in Scotland, concerning a Troop of Horse gone there. Letter to them, about them. Letter from Sir Tho. Fairfax, that Captain Wogan is gone with his Troop to Scotland, though he had ordered him to disband it. Ordinance to raise 60,000l. a Month for the Army. 2. 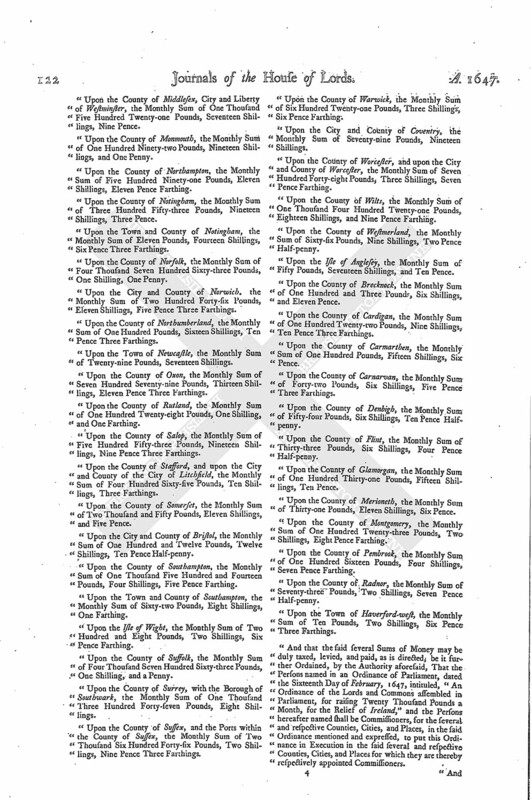 The Ordinance for giving Leave to transport Wool to Guernsey. 3. The Ordinance concerning the Great Seal. 4. 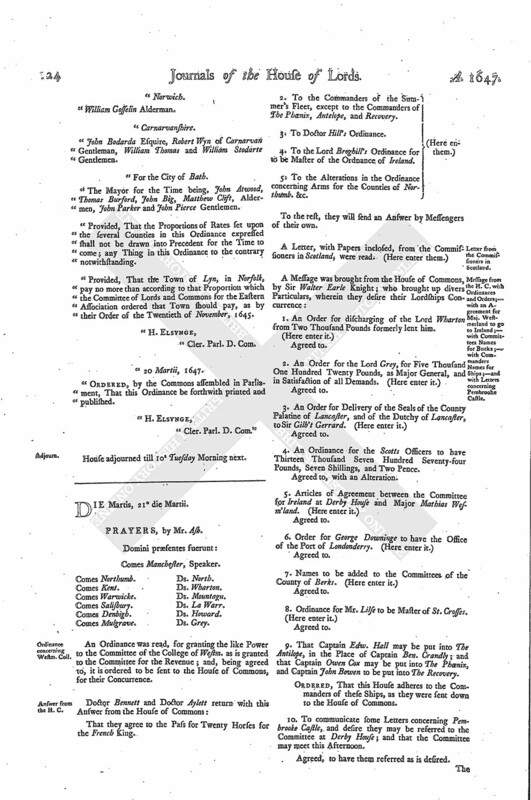 The Order for a General Pardon for Hannah Tarrent. 5. The Letter and Instructions to the Commissioners in Scotland. To all the rest of the Particulars, that House will send an Answer by Messengers of their own. An Ordinance for making the Lord Broghill Master of the Ordnance in Ireland, was brought, and read, and approved of; and ordered to be sent to the House of Commons for their Concurrence. A Petition of the Lady Borlace, to desire some Monies may be appointed for the Funeral of (fn. 1) her Husband, was read; and ordered to be recommended the House of Commons. 1. The Ordinance concerning Dr. Hill, with an Addition. 2. The List of the Commanders of this Summer's Fleet. 3. 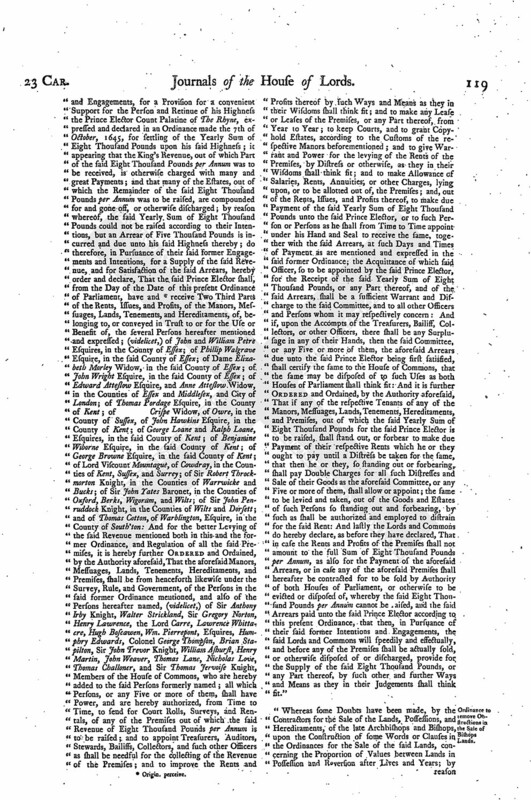 The Petition of the Lady Borlace. 4. The Ordinance for the Lord Broghill. 5. To put them in Mind of the Pass for Twenty Horse for the Service of the French King; and that, in the mean Time, the Horses may not be molested. Upon reading the Petition of Ann and Eliz. Daughters of Edward Earl of Worcester; desiring, "some competent Proportion of Lands in certain, of their Father's remaining Estate, sequestered, may be settled upon them, for their Maintenance and Support in Time to come:"
It is Ordered, To be sent down to the House of Commons, with Recommendations. Ordered, That Tuesday next this House will take into Consideration the pretended Title and Claim which Sir John Brooke lays to the Barony of Lord Cobham; and then the Heralds are to attend the House concerning it. It is referred to the Committee for the Admiralty, to do therein as they shall think fit. Ordered, That Doctor Heath shall give Institution and Induction to Rob't Bridges Clerk, to the Rectory of South Croxton, in the County of Leycester; presented thereunto by the Earl of Rutland; and this to be with a Salvo Jure cujuscunque. 2. To desire their Lordships would please to appoint a Time when the Earl of Kent and the Lord Grey shall be sworn Commissioners of the Great Seal of England. Appointed to be this Morning. 3. An Ordinance for the Prince Elector to have Eight Thousand Pounds per Annum. 4. Two additional Ordinances concerning the Sale of the Bishops Lands. 5. An Order concerning Rich. Turner and Tempest Milner, &c.
6. An Order for Sir Charles Coate, for Two Thousand Pounds. 8. An Order for (fn. 2) paying One Thousand Six Hundred Eighty-one Pounds, Sixteen Shillings, and Eight Pence, unto Major Wither, out of the Receipts of the Excise, in Course, in Satisfaction of his Arrears. 9. An Ordinance for pardoning the Delinquency of Sir John Fitzherbert and Sir Andrew Knifton. 10. Ordinance for pardoning the Delinquency of Sir Humble Ward. 11. Ordinance for One Thousand Four Hundred Forty Pounds, Seven Shillings, and Seven Pence, to be paid to Captain Gardiner. 12. An Ordinance for Interest for One Thousand Four Hundred Forty Pounds, Seven Shillings, and Seven Pence, to Captain Sam. Gardiner. 13. An Ordinance for Seven Hundred Fifteen Pounds to be paid to Captain Sam. Gardiner. 14. 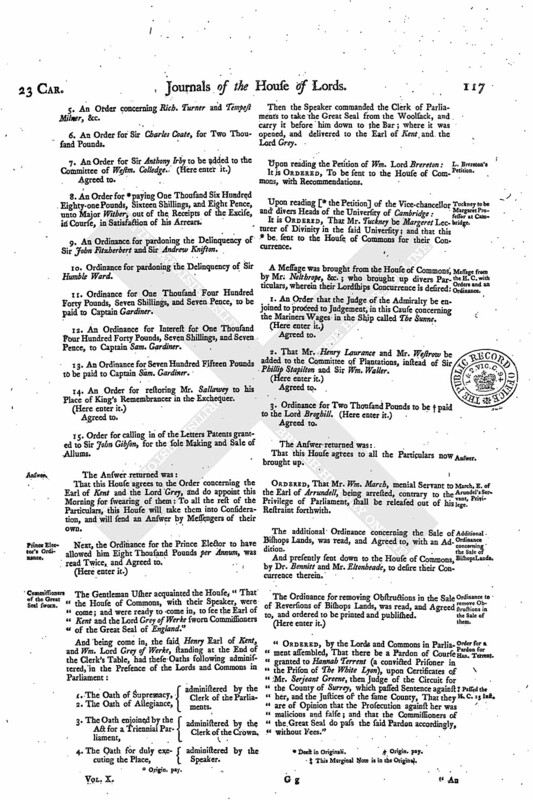 An Order for restoring Mr. Sallawey to his Place of King's Remembrancer in the Exchequer. 15. Order for calling in of the Letters Patents granted to Sir John Gibson, for the sole Making and Sale of Allums. That this House agrees to the Order concerning the Earl of Kent and the Lord Grey, and do appoint this Morning for swearing of them: To all the rest of the Particulars, this House will take them into Consideration, and will send an Answer by Messengers of their own. Next, the Ordinance for the Prince Elector to have allowed him Eight Thousand Pounds per Annum, was read Twice, and Agreed to. The Gentleman Usher acquainted the House, "That the House of Commons, with their Speaker, were come; and were ready to come in, to see the Earl of Kent and the Lord Grey of Werke sworn Commissioners of the Great Seal of England." 1. The Oath of Supremacy, administered by the Clerk of the Parliaments. 3. The Oath enjoined by the Act for a Triennial Parliament, administered by the Clerk of the Crown. 4. The Oath for duly executing the Place, administered by the Speaker. Then the Speaker commanded the Clerk of Parliaments to take the Great Seal from the Woolsack, and carry it before him down to the Bar; where it was opened, and delivered to the Earl of Kent and the Lord Grey. It is Ordered, To be sent to the House of Commons, with Recommendations. It is Ordered, That Mr. Tuckney be Margeret Lecturer of Divinity in the said University; and that this (fn. 3) be sent to the House of Commons for their Concurrence. 1. An Order that the Judge of the Admiralty be enjoined to proceed to Judgement, in this Cause concerning the Mariners Wages in the Ship called The Sunne. 2. That Mr. Henry Laurance and Mr. Westrow be added to the Committee of Plantations, instead of Sir Phillip Stapilton and Sir Wm. Waller. That this House agrees to all the Particulars now brought up. Ordered, That Mr. Wm. March, menial Servant to the Earl of Arrundell, being arrested, contrary to the Privilege of Parliament, shall be released out of his Restraint forthwith. The additional Ordinance concerning the Sale of Bishops Lands, was read, and Agreed to, with an Addition. And presently sent down to the House of Commons, by Dr. Bennitt and Mr. Eltonheade, to desire their Concurrence therein. 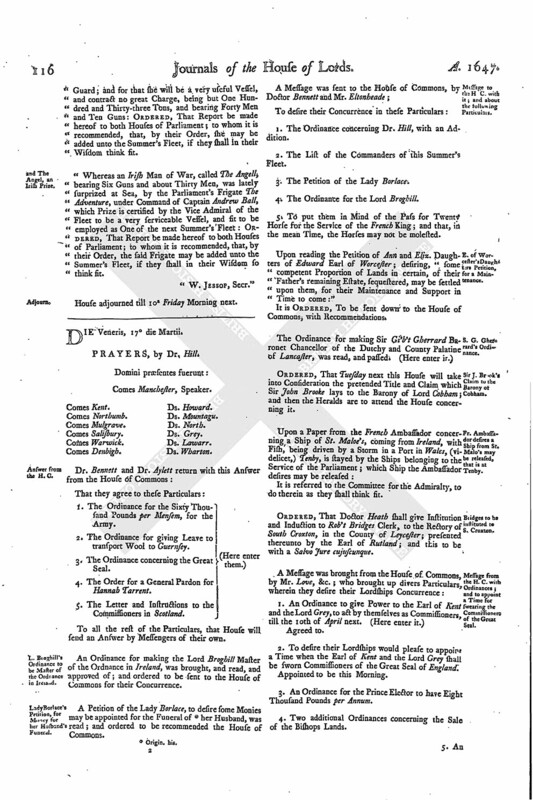 The Ordinance for removing Obstructions in the Sale of Reversions of Bishops Lands, was read, and Agreed to, and ordered to be printed and published. (fn. 5) Passed the H. C. 15 Inst. "Ordered, by the Lords and Commons in Parliament assembled, That there be a Pardon of Course granted to Hannah Terrent (a convicted Prisoner in the Prison of The White Lyon), upon Certificates of Mr. Serjeant Greene, then Judge of the Circuit for the County of Surrey, which passed Sentence against her, and the Justices of the same County, That they are of Opinion that the Prosecution against her was malicious and false; and that the Commissioners of the Great Seal do pass the said Pardon accordingly, without Fees." "An Ordinance of the Lords and Commons assembled in Parliament, for committing the Great Seal of England into the Hands and Custody of Commissioners. (fn. 6) Passed H. C. 15 Instant. "The Lords and Commons in Parliament assembled do order and ordain, and be it Ordained, That the Great Seal of England shall be committed to the Custody and Keeping of Henry Earl of Kent, William Lord Grey of Werke, Sir Thomas Widdrington Knight, and Bulstrod Whitlocke Esquire, who are hereby ordained Commissioners for that Purpose, for and during the Time of One whole Year from the Passing of this present Ordinance; which said Persons are hereby constituted and appointed to be Commissioners for the Custody of the said Great Seal of England during the Time aforesaid; and they, or any Two of them, whereof One Member of the Lords House, also One Member of the House of Commons, shall have, and are hereby authorized to have, the Custody, Keeping, Ordering, and Disposing thereof; as also all such and the like Powers and Authorities as any Lord Chancellor, or Lord Keeper, or Commissioners of the Great Seal of England, for the Time being, hath lawfully had and used, or ought to have had or used." "Whereas both Houses of Parliament did, by their Ordinance of the 19th of January last past, prohibit the Exportation of any Wool, of the Growth of the Kingdom of England or Ireland, or Dominion of Wales, or any Woollen Yarn, Woollen Flocks, Wool Fell, &c. into any Place or Places of the Parts beyond the Seas; whereupon the Officers of the Customs, to whom it appertains, have refused to permit the Inhabitants of Guernsey to transport unto that Island the usual Proportion of Wool granted unto them by their Charters, for employing the People of that Island in Manufactures; whereby much Prejudice is like to accrue unto them: Be it therefore hereby Declared, That the said Ordinance, or any Clause therein contained, shall not extend to the Prohibition of the Transportation of Five Hundred Todds of Wool unto the said Island, as is granted unto them by their former Charter: And, to that Purpose, be it Ordained, by the Lords and Commons assembled in Parliament, That all the Officers of the Customs whom it may concern do permit and suffer the said Inhabitants to transport, out of the Ports of London, Southampton, Weymouth, Poole, Lyme, or any of them, and not elsewhere, the said Quantity of Wool; they first taking out a Licence from the Commissioners of the Customs, the Customer and Comptroller in the Port of London, or any Two of them, for that Quantity which they desire to transport from any of the said Ports, that so there may not any Year be transported a greater Quantity than the aforesaid Proportion of Five Hundred Todds Yearly; and they giving Security in the said Port from whence they transport the same, to transport the same to the said Island, and to no other Place; and returning Certificate thereof from the Governor of the said Island, or his Deputy, unto the said Commissioners, Customer, and Comptroller aforesaid." "The Lords and Commons in Parliament assembled do order and ordain, and be it Ordered and Ordained, That Sir Gilbert Gerard Baronet be, and is hereby, made, appointed, and constituted, Chancellor of the Dutchy of Lancaster, and Chancellor of the County Palatine of Lancaster; to have, hold, exercise, and enjoy, the said Offices, together with all the Fees, Privileges, Rights, and Pre-eminencies, to the said Offices, or either of them, of Right belonging, to him the said Sir Gilbert Gerard Baronet, quam diu bene se gesserit: And it is further Ordered and Ordained, That the Clerk of the Court of the said Dutchy do forthwith prepare a Patent, in the usual Form, to pass the Seals of the said Dutchy and County Palatine of Lancaster, for the constituting of the said Sir Gilbert Gerard Chancellor of the said Dutchy and County Palatine accordingly." "Ordered, by the Lords and Commons in Parliament assembled, That Henry Earl of Kent and Wm. Lord Grey of Werke are hereby authorized, until the 10th of April next, to sign and seal all such Commissions, Patents, Writs, and other Process, as are to be sealed by the Great Seal of England." "Ordered, by the Lords and Commons assembled in Parliament, That Sir Anthony Irby Knight be added to the Committee of Westm'r Colledge, in the Place of John Glynn Esquire." "Ordered, by the Lords and Commons assembled in Parliament, That Mr. Salwey Senior (a Member of the House of Commons) be restored to the Place and Office of Remembrancer in the Exchequer; and enjoy and receive the Benefits, Profits, and Advantage thereof, according to the Grant thereof made unto him by Ordinance of Parliament, and passed unto him by Letters Patent under the Great Seal of England; notwithstanding any Order or Ordinances to the contrary." "The humble Petition of John Rogers, Martin Carslacke, and Seventy more Mariners, late serving in the Ship The Sunne, was this Day read. "Ordered, upon the Question, by the Lords and Commons in Parliament assembled, That the Judge of the Admiralty be enjoined to proceed to Judgement in this Cause, concerning the Mariners Wages." 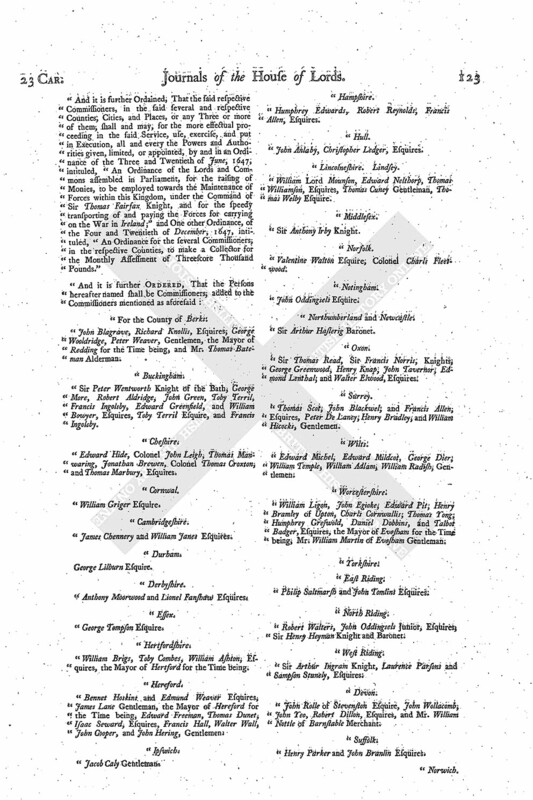 "Ordered, by the Lords and Commons in Parliament assembled, That Mr. Henry Lawrence and Mr. Westrowe be added to the Committee of Plantations, instead of Sir Phillip Stapilton and Sir Wm. Waller." "Ordered, by the Lords and Commons in Parliament assembled, and by the Authority of the same, That the Sum of Two Thousand Pounds be paid unto Roger Lord Broghill, his Executors and Assigns, upon Accompt, in Part of his Arrears, and charged upon the Receipts of the Excise, in Course, next after the Sums already charged upon the Excise before the Date of this Order; and that the said Sum of Two Thousand Pounds, in all or in Part, shall be paid unto such Person or Persons, their Executors or Assigns, to whom the said Lord Broghill shall, by Writing under his Hand and Seal, appoint and declare the same or any Part thereof to be paid, out of the Receipts of the said Excise, in Course, as is hereby ordered; and that the Receipts of all or any Part of the said Two Thousand Pounds, under the Hand and Seal of the said Lord Broghill, or such Person or Persons, their Executors and Assigns, to whom the said Lord Broghill shall in Manner aforesaid assign and declare the same or any Part of the same to be paid, shall be in that Behalf a good Discharge and Warrant, for Allowance of so much of the said Two Thousand Pounds as the Commissioners and Officers of the Excise shall pay accordingly." "An additional Ordinance of the Lords and Commons assembled in Parliament, for the better raising of the Yearly Sum of Eight Thousand Pounds, for the Support of His Highness Charles Lodowicks Prince Elector Count Palatine of The Rhyne. "The Lords and Commons assembled in Parliament, taking into their Consideration their former Intentious and Engagements, for a Provision for a convenient Support for the Person and Retinue of his Highness the Prince Elector Count Palatine of The Rhyne, expressed and declared in an Ordinance made the 7th of October, 1645, for settling of the Yearly Sum of Eight Thousand Pounds upon his said Highness; it appearing that the King's Revenue, out of which Part of the said Eight Thousand Pounds per Annum was to be received, is otherwise charged with many and great Payments; and that many of the Estates, out of which the Remainder of the said Eight Thousand Pounds per Annum was to be raised, are compounded for and gone off, or otherwise discharged; by reason whereof, the said Yearly. Sum of Eight Thousand Pounds could not be raised according to their Intentions, but an Arrear of Five Thousand Pounds is incurred and due unto his said Highness thereby; do therefore, in Pursuance of their said former Engagements and Intentions, for a Supply of the said Revenue, and for Satisfaction of the said Arrears, hereby order and declare, That the said Prince Elector shall, from the Day of the Date of this present Ordinance of Parliament, have and (fn. 7) receive Two Third Parts of the Rents, Issues, and Profits, of the Manors, Messuages, Lands, Tenements, and Hereditaments, of, belonging to, or conveyed in Trust to or for the Use or Benefit of, the several Persons hereafter mentioned and expressed; (videlicet,) of John and William Petre Esquires, in the County of Essex; of Phillip Walgrave Esquire, in the said County of Essex; of Dame Elizabeth Morley Widow, in the said County of Essex; of John Wright Esquire, in the said County of Essex; of Edward Atteslow Esquire, and Anne Atteslow Widow, in the Counties of Essex and Middlesex, and City of London; of Thomas Pordage Esquire, in the County of Kent; of Crispe Widow, of Owre, in the County of Sussex, of John Hawkins Esquire, in the County of Kent; of George Loane and Ralph Loane, Esquires, in the said County of Kent; of Benjamine Wiborne Esquire, in the said County of Kent; of George Browne Esquire, in the said County of Kent; of Lord Viscount Mountague, of Cowdray, in the Counties of Kent, Sussex, and Surrey; of Sir Robert Throckmorton Knight, in the Counties of Warrwicke and Bucks; of Sir John Yates Baronet, in the Counties of Oxford, Berks, Wigorum, and Wilts; of Sir John Penruddock Knight, in the Counties of Wilts and Dorsett; and of Thomas Cotton, of Warblington, Esquire, in the County of South'ton: And for the better Levying of the said Revenue mentioned both in this and the former Ordinance, and Regulation of all the said Premises, it is hereby further Ordered and Ordained, by the Authority aforesaid, That the aforesaid Manors, Messuages, Lands, Tenements, Hereditaments, and Premises, shall be from henceforth likewise under the Survey, Rule, and Government, of the Persons in the said former Ordinance mentioned, and also of the Persons hereafter named, (videlicet,) of Sir Anthony Irby Knight, Walter Strickland, Sir Gregory Norton, Henry Lawrence, the Lord Carre, Lawrence Whittacre, Hugh Boscawen, Wm. Pierrepont, Esquires, Humphry Edwards, Colonel George Thompson, Brian Stapilton, Sir John Trevor Knight, William Ashurst, Henry Martin, John Weaver, Thomas Lane, Nicholas Love, Thomas Challoner, and Sir Thomas Jervoise Knight, Members of the House of Commons, who are hereby added to the said Persons formerly named; all which Persons, or any Five or more of them, shall have Power, and are hereby authorized, from Time to Time, to send for Court Rolls, Surveys, and Rentals, of any of the Premises out of which the said Revenue of Eight Thousand Pounds per Annum is to be raised; and to appoint Treasurers, Auditors, Stewards, Bailiffs, Collectors, and such other Officers as shall be needful for the collecting of the Revenue of the Premises; and to improve the Rents and Profits thereof by such Ways and Means as they in their Wisdoms shall think fit; and to make any Lease or Leases of the Premises, or any Part thereof, from Year to Year; to keep Courts, and to grant Copyhold Estates, according to the Customs of the respective Manors beforementioned; and to give Warrant and Power for the levying of the Rents of the Premises, by Distress or otherwise, as they in their Wisdoms shall think fit; and to make Allowance of Salaries, Rents, Annuities, or other Charges, lying upon, or to be allotted out of, the Premises; and, out of the Rents, Issues, and Profits thereof, to make due Payment of the said Yearly Sum of Eight Thousand Pounds unto the said Prince Elector, or to such Person or Persons as he shall from Time to Time appoint under his Hand and Seal to receive the same, together with the said Arrears, at such Days and Times of Payment as are mentioned and expressed in the said former Ordinance; the Acquittance of which said Officer, so to be appointed by the said Prince Elector, for the Receipt of the said Yearly Sum of Eight Thousand Pounds, or any Part thereof, and of the said Arrears, shall be a sufficient Warrant and Discharge to the said Committee, and to all other Officers and Persons whom it may respectively concern: And if, upon the Accompts of the Treasurers, Bailiff, Collectors, or other Officers, there shall be any Surplusage in any of their Hands, then the said Committee, or any Five or more of them, the aforesaid Arrears due unto the said Prince Elector being first satisfied, shall certify the same to the House of Commons, that the same may be disposed of to such Uses as both Houses of Parliament shall think fit: And it is further Ordered and Ordained, by the Authority aforesaid, That if any of the respective Tenants of any of the Manors, Messuages, Lands, Tenements, Hereditaments, and Premises, out of which the said Yearly Sum of Eight Thousand Pounds for the said Prince Elector is to be raised, shall stand out, or forbear to make due Payment of their respective Rents which he or they ought to pay until a Distress be taken for the same, that then he or they, so standing out or forbearing, shall pay Double Charges for all such Distresses and Sale of their Goods as the aforesaid Committee, or any Five or more of them, shall allow or appoint; the same to be levied and taken, out of the Goods and Estates of such Persons so standing out and forbearing, by such as shall be authorized and employed to distrain for the said Rent: And lastly the Lords and Commons do hereby declare, as before they have declared, That in case the Rents and Profits of the Premises shall not amount to the full Sum of Eight Thousand Pounds per Annum, as also for the Payment of the aforesaid Arrears, or in case any of the aforesaid Premises shall hereafter be contracted for to be sold by Authority of both Houses of Parliament, or otherwise to be evicted or disposed of, whereby the said Eight Thousand Pounds per Annum cannot be raised, and the said Arrears paid unto the said Prince Elector according to this present Ordinance, that then, in Pursuance of their said former Intentions and Engagements, the said Lords and Commons will speedily and effectually, and before any of the Premises shall be actually sold, or otherwise disposed of or discharged, provide for the Supply of the said Eight Thousand Pounds, or any Part thereof, by such other and further Ways and Means as they in their Judgements shall think fit." 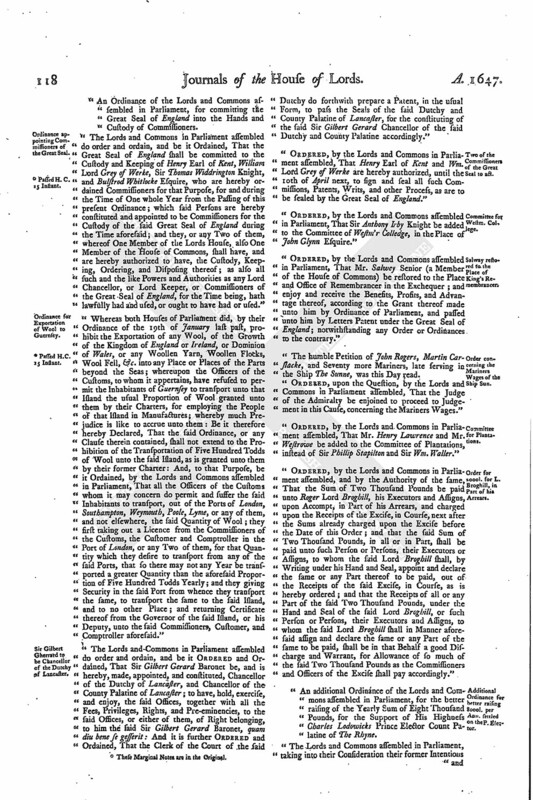 "Whereas some Doubts have been made, by the Contractors for the Sale of the Lands, Possessions, and Hereditaments, of the late Archbishops and Bishops, upon the Construction of some Words or Clauses in the Ordinances for the Sale of the said Lands, concerning the Proportion of Values between Lands in Possession and Reversion after Lives and Years; by reason of which, the Sale of the said Lands hath been obstructed: The Lords and Commons in Parliament assembled do ordain and declare, and be it Ordained and Declared, That the Reversion of the said Lands and Hereditaments upon a Lease for One Life shall not be sold under Five Years Purchase; and the Reversion of such Lands upon a Lease for Two Lives shall not be sold under Three Years Purchase; and that the Reversion of such Lands upon a Lease for Three Lives shall not be sold under Two Years Purchase; and all other Reversions of the said Lands for more than Three Lives, and the Reversion where any Tenant or Tenants of the said Premises claim, and have a Right to have, a Customary Estate in Reversion, or by the Custom may grant or make Leases for Life or Lives, the said Contractors are hereby enabled and authorized to contract for and sell proportionably: And be it Ordained and Declared, by the Authority aforesaid, That the Reversion of the said Lands and Hereditaments upon a Lease for Seven Years shall not be sold under Five Years and One Half Year's Purchase; and that a Reversion of such Lands upon a Lease for Fourteen Years shall not be sold under Three Years and One Half's Purchase; and that a Reversion of such Lands upon a Lease for One and Twenty Years shall not be sold under Two Years and One Half's Purchase; and all other Reversions upon Leases, for more or fewer Years, the said Contractors are hereby authorized to contract for and sell, proportionably to this Rule: And the said Lords and Commons do ordain and declare, That the aforementioned Proportions shall be the Rule of Proportion for proportioning Reversions upon Leases for Lives and Years, to Lands in Possession of Ten Years Purchase; and the said Contractors are hereby authorized to contract for and sell the said Reversions, according to the aforementioned Rules of Proportion; any Order, Ordinance of Parliament, or any Word or Clause in any Order or Ordinance of Parliament, to the contrary, in any Wise notwithstanding." "Instructions for the Commissioners from the Parliament of England residing with the Parliament of Scotland. (fn. 8) Passed H. C. 15 Instant. "1. You are to make known to the Parliament of Scotland, the Convention, or Committee of Estates, or any other Committee that shall be appointed to debate with you, what the Houses of Parliament know, concerning the Troop of Horse of Captain Wogan, and the Manner and Pretences of their Passage into Scotland; the State of which Business (as far as the House is informed thereof) is expressed in a Letter from the General to the Committee at Derby House concerning the same, of which you have herewith a Copy. "2. You are to assure the Parliament of Scotland, Convention, or Committee of Estates, or any other Committee as abovesaid, that the March of the said Troop of Captain Wogan's, in a Military Posture or otherwise, out of this Kingdom into Scotland, or any other Forces (if any such Thing be), is altogether without the Allowance, Order, or Privity, of the Parliament of England; and therefore you are, in the Name of both Houses of the Parliament of England, to demand from the Parliament of Scotland, That the said Captain Wogan, and his Officers that are Englishmen, and also the English Officers of any other Forces that may be passed over out of this Kingdom into Scotland, as also all such Officers and Reformadoes now in Scotland as you shall find to have at any Time served the King against the Parliament, may be all forthwith apprehended, secured, and delivered over to you, to be sent Prisoners into England; and that all the Private Soldiers may be dismounted, dispersed, and sent Home; and the Horses and Arms of the said Captain Wogan, and the Officers and Soldiers aforesaid, you shall cause to be sent into England, for the Service of the Parliament. "3. You are to take Care that the said Persons, being secured, may be sent by Sea into England; and for that Purpose, you are to hire a Ship there, and send them thence to Newcastle by Sea. "4 You are to make the like Demands of any other Persons, Horses, and Arms, of any other Forces that shall at any Time come into Scotland, in a Military Posture, during the Time of your Employment there. "The Houses of Parliament having received Information concerning a Troop of Horse, under the Command of one Captain Wogan, and some other Discontented and Disaffected, who, in a Military Posture, with Officers and Colours, have lately marched out of this Kingdom into Scotland, have commanded (fn. 9) us to acquaint you with so much as they are informed concerning that Business, and to send you some Instructions for proceeding about the same. The State of the Business concerning Captain Wogan's Troop, with the Manner and Pretexts of his passing into Scotland, you will understand by a Letter from the General about it (whereof we here send you a Copy). For any other Forces that may be gone out of this Kingdom into Scotland, we do not yet understand in particular what they are; but whatever they be, you will see by the Instructions herewith sent, how you are to proceed concerning them; of your Proceeding whereupon, as also what Answer you receive from the Parliament of Scotland or their Commissioners therein, you are to return us a speedy Account." (fn. 11) "15 Martii, 1647. "An Ordinance of the Lords and Commons assembled in Parliament, for raising Monies, to be employed for the Maintenance of the Forces under the Command of Sir Thomas Fairfax Knight. "Upon the County of Bedford, the Monthly Sum of Six Hundred Seventy-three Pounds, Thirteen Shillings, Eleven Pence Three Farthings. "Upon the County of Berks, the Monthly Sum of Six Hundred Eighty-three Pounds, Fifteen Shillings, and Nine Pence. "Upon the County of Buckingham, the Monthly Sum of Eight Hundred Fifteen Pounds, Eight Shillings. "Upon the County of Cambridge, the Monthly Sum of One Thousand Four Hundred Sixty-two Pounds, Sixteen Shillings, Six Pence Farthing. "Upon the Isle of Ely, the Monthly Sum of Four Hundred Ninety Pounds, Eighteen Shillings, One Half-penny. "Upon the County of Chester, the Monthly Sum of Three Hundred Forty-five Pounds, Four Shillings, Eleven Pence-Farthing. "Upon the City and County of Chester, the Monthly Sum of Thirty-nine Pounds, Thirteen Shillings, and Eleven Pence. "Upon the County of Cornwal, the Monthly Sum of One Thousand Two Hundred Twenty-eight Pounds, Five Shillings, Six Pence Farthing. "Upon the County of Cumberland, the Monthly Sum of Seventy-seven Pounds, One Penny Three Farthings. "Upon the County of Derby, the Monthly Sum of Three Hundred Forty-two Pounds, Nine Shillings, Four Pence. "Upon the County of Devon, the Monthly Sum of Three Thousand Five Hundred Twenty-seven Pounds, Six Shillings, Penny Half-penny. "Upon the City and County of Exon, the Monthly Sum of One Hundred Twenty-seven Pounds, Nine Shillings, Two Pence Farthing. "Upon the County of Dorset, the Monthly Sum of Nine Hundred Thirty-five Pounds, Ten Shillings, Ten Pence Three Farthings. "Upon the Town and County of Pool, the Monthly Sum of Nine Pounds, Sixteen Shillings, Seven Pence Half-penny. "Upon the County of Durham, the Monthly Sum of One Hundred Fifty-nine Pounds, Two Shillings. "Upon the County of York, and the City and County of York, the Monthly Sum of Two Thousand Two Hundred Sixty Pounds, Nineteen Shillings, Two Pence. "Upon the Town and County of Kingston upon Hull, the Monthly Sum of Fifty Pounds, Eighteen Shillings, Nine Pence. "Upon the County of Essex, the Monthly Sum of Four Thousand Five Hundred Forty-seven Pounds, Nine Shillings, Five Pence. "Upon the County of Glocester, the Monthly Sum of One Thousand Two Hundred Twelve Pounds, Three Shillings, Six Pence Three Farthings. "Upon the City and County of Glocester, the Monthly Sum of One Hundred Thirty-four Pounds; Thirteen Shillings, Nine Pence. "Upon the County of Hereford, the Monthly Sum of Eight Hundred Sixty-eight Pounds; Two Shillings, Three Pence. "Upon the County of Hertford, the Monthly Sum of One Thousand Six Hundred Thirty-eight Pounds, Fifteen Shillings, Five Pence Three Farthings. "Upon the County of Huntington; the Monthly Sum of Six Hundred Eighty-seven Pounds; Three Shillings, Five Pence Three Farthings. "Upon the County of Kent, with the City and County of Canterbury, and the Cinque Ports within the County of Kent, the Monthly Sum of Four Thousand Seven Hundred Sixty-three Pounds, One Shilling, One Penny. "Upon the County of Lancaster, the Monthly Sum of Five Hundred Twenty-nine Pounds, Three Shillings, Two Pence. "Upon the County of Leicester, the Monthly Sum of Four Hundred Sixty-seven Pounds; Nine Shillings, Ten Pence Half-penny. "Upon the County of Lincoln (and the City and County of Lincoln), the Monthly Sum of One Thousand Six Hundred Thirty-eight Pounds, One Shilling, Half-penny. "Upon the City of London, the Monthly Sum of Three Thousand Nine Hundred and Seven Pounds, Nineteen Shillings, and Two Pence Three Farthings. "Upon the County of Middlesex, City and Liberty of Westminster, the Monthly Sum of One Thousand Five Hundred Twenty-one Pounds, Seventeen Shillings, Nine Pence. "Upon the County of Monmouth, the Monthly Sum of One Hundred Ninety-two Pounds, Nineteen Shillings, and One Penny. "Upon the County of Northampton, the Monthly Sum of Five Hundred Ninety-one Pounds, Eleven Shillings, Eleven Pence Farthing. "Upon the County of Notingham, the Monthly Sum of Three Hundred Fifty-three Pounds, Nineteen Shillings, Three Pence. "Upon the Town and County of Notingham, the Monthly Sum of Eleven Pounds, Fourteen Shillings, Six Pence Three Farthings. "Upon the County of Norfolk, the Monthly Sum of Four Thousand Seven Hundred Sixty-three Pounds, One Shilling, One Penny. "Upon the City and County of Norwich. the Monthly Sum of Two Hundred Forty-six Pounds, Eleven Shillings, Five Pence Three Farthings. "Upon the County of Northumberland, the Monthly Sum of One Hundred Pounds, Sixteen Shillings, Ten Pence Three Farthings. "Upon the Town of Newcastle, the Monthly Sum of Twenty-nine Pounds, Seventeen Shillings. "Upon the County of Oxon, the Monthly Sum of Seven Hundred Seventy-nine Pounds, Thirteen Shillings, Eleven Pence Three Farthings. "Upon the County of Rutland, the Monthly Sum of One Hundred Twenty-eight Pounds, One Shilling, and One Farthing. "Upon the County of Salop, the Monthly Sum of Five Hundred Fifty-three Pounds, Nineteen Shillings, Nine Pence Three Farthings. "Upon the County of Stafford, and upon the City and County of the City of Litchfield, the Monthly Sum of Four Hundred Sixty-five Pounds, Ten Shillings, Three Farthings. "Upon the County of Somerset, the Monthly Sum of Two Thousand and Fifty Pounds, Eleven Shillings, and Five Pence. "Upon the City and County of Bristol, the Monthly Sum of One Hundred and Twelve Pounds, Twelve Shillings, Ten Pence Half-penny. "Upon the County of Southampton, the Monthly Sum of One Thousand Five Hundred and Fourteen Pounds, Four Shillings, Five Pence Farthing. "Upon the Town and County of Southampton, the Monthly Sum of Sixty-two Pounds, Eight Shillings, One Farthing. "Upon the Isle of Wight, the Monthly Sum of Two Hundred and Eight Pounds, Two Shillings, Six Pence Farthing. "Upon the County of Suffolk, the Monthly Sum of Four Thousand Seven Hundred Sixty-three Pounds, One Shilling, and a Penny. "Upon the County of Surrey, with the Borough of Southwark, the Monthly Sum of One Thousand Three Hundred Forty-seven Pounds, Eight Shillings. "Upon the County of Sussex, and the Ports within the County of Sussex, the Monthly Sum of Two Thousand Six Hundred Forty-six Pounds, Two Shillings, Nine Pence Three Farthings. "Upon the County of Warwick, the Monthly Sum of Six Hundred Twenty-one Pounds, Three Shillings, Six Pence Farthing. "Upon the City and County of Coventry, the Monthly Sum of Seventy-nine Pounds, Nineteen Shillings. "Upon the County of Worcester, and upon the City and County of Worcester, the Monthly Sum of Seven Hundred Forty-eight Pounds, Three Shillings, Seven Pence Farthing. "Upon the County of Wilts, the Monthly Sum of One Thousand Four Hundred Twenty-one Pounds, Eighteen Shillings, and Nine Pence Farthing. "Upon the County of Westmerland, the Monthly Sum of Sixty-six Pounds, Nine Shillings, Two Pence Half-penny. "Upon the Isle of Anglesey, the Monthly Sum of Fifty Pounds, Seventeen Shillings, and Ten Pence. "Upon the County of Brecknock, the Monthly Sum of One Hundred and Three Pounds, Six Shillings, and Eleven Pence. "Upon the County of Cardigan, the Monthly Sum of One Hundred Twenty-two Pounds, Nine Shillings, Ten Pence Three Farthings. "Upon the County of Carmarthen, the Monthly Sum of One Hundred Pounds, Fifteen Shillings, Six Pence. "Upon the County of Carnarvan, the Monthly Sum of Forty-two Pounds, Six Shillings, Five Pence Three Farthings. "Upon the County of Denbigh, the Monthly Sum of Fifty-four Pounds, Six Shillings, Ten Pence Halfpenny. "Upon the County of Flint, the Monthly Sum of Thirty-three Pounds, Six Shillings, Four Pence Half-penny. "Upon the County of Glamorgan, the Monthly Sum of One Hundred Thirty-one Pounds, Fifteen Shillings, Ten Pence. "Upon the County of Merioneth, the Monthly Sum of Thirty-one Pounds, Eleven Shillings, Six Pence. "Upon the County of Montgomery, the Monthly Sum of One Hundred Twenty-three Pounds, Two Shillings, Eight Pence Farthing. "Upon the County of Pembrook, the Monthly Sum of One Hundred Sixteen Pounds, Four Shillings, Seven Pence Farthing. "Upon the County of Radnor, the Monthly Sum of Seventy-three Pounds, Two Shillings, Seven Pence Half-penny. "Upon the Town of Haverford-west, the Monthly Sum of Ten Pounds, Two Shillings, Six Pence Three Farthings. 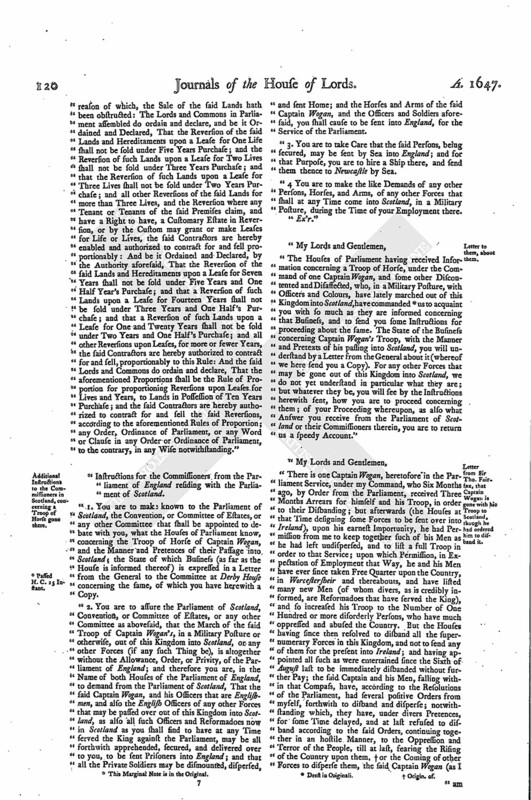 "And that the said several Sums of Money may be duly taxed, levied, and paid, as is directed, be it further Ordained, by the Authority aforesaid, That the Persons named in an Ordinance of Parliament, dated the Sixteenth Day of February, 1647, intituled, "An Ordinance of the Lords and Commons assembled in Parliament, for raising Twenty Thousand Pounds a Month, for the Relief of Ireland," and the Persons hereafter named shall be Commissioners, for the several and respective Counties, Cities, and Places, in the said Ordinance mentioned and expressed, to put this Ordinance in Execution in the said several and respective Counties, Cities, and Places for which they are thereby respectively appointed Commissioners. "And it is further Ordained, That the said respective Commissioners, in the said several and respective Counties, Cities, and Places, or any Three or more of them, shall and may, for the more effectual proceeding in the said Service, use, exercise, and put in Execution, all and every the Powers and Authorities given, limited, or appointed, by and in an Ordinance of the Three and Twentieth of June, 1647, intituled, "An Ordinance of the Lords and Commons assembled in Parliament, for the raising of Monies, to be employed towards the Maintenance of Forces within this Kingdom, under the Command of Sir Thomas Fairfax Knight, and for the speedy transporting of and paying the Forces for carrying on the War in Ireland;" and One other Ordinance, of the Four and Twentieth of December, 1647, intituled, "An Ordinance for the several Commissioners, in the respective Counties, to make a Collector for the Monthly Assessment of Threescore Thousand Pounds." "For the County of Berks. "John Blagrave, Richard Knollis, Esquires, George Wooldridge, Peter Weaver, Gentlemen, the Mayor of Redding for the Time being, and Mr. Thomas Bateman Alderman. "Sir Peter Wentworth Knight of the Bath, George More, Robert Aldridge, John Green, Toby Terril, Francis Ingolsby, Edward Greenfield, and William Bowyer, Esquires, Toby Terril Esquire, and Francis Ingolsby. "Edward Hide, Colonel John Leigh, Thomas Manwaring, Jonathan Brewen, Colonel Thomas Croxton, and Thomas Marbury, Esquires. "James Chennery and William Janes Esquires. "Anthony Moorwood and Lionel Fanshaw Esquires. "William Brigs, Toby Combes, William Ashton, Esquires, the Mayor of Hertford for the Time being. "Bennet Hoskins and Edmund Weaver Esquires, James Lane Gentleman, the Mayor of Hereford for the Time being, Edward Freeman, Thomas Dunet, Isaac Seward, Esquires, Francis Hall, Walter Wall, John Cooper, and John Hering, Gentlemen. "Humphrey Edwards, Robert Reynolds, Francis Allen, Esquires. "John Anlaby, Christopher Ledger, Esquires. "William Lord Mounson, Edward Nelthorp, Thomas Williamson, Esquires, Thomas Cuney Gentleman, Thomas Welby Esquire. "Valentine Walton Esquire, Colonel Charls Fleetwood. "Sir Thomas Read, Sir Francis Norris; Knights, George Greenwood, Henry Knap, John Tavernor, Edmond Lenthal; and Walter Elwood, Esquires. "Thomas Scot, John Blackwel; and Francis Allen; Esquires, Peter De Laney, Henry Bradley, and William Hicocks, Gentlemen. "Edward Michel, Edward Mildcot, George Dier, William Temple, William Adlam, William Radish, Gentlemen. "William Ligon, John Egioke, Edward Pit, Henry Bramley of Upton, Charls Cornwallis; Thomas Yong; Humphrey Greswold, Daniel Dobbins, and Talbot Badger, Esquires, the Mayor of Evesham for the Time being, Mr. William Martin of Evesham Gentleman. "Philip Saltmarsh and John Tomlins Esquires. "Robert Walters, John Oddingsels Junior, Esquires, Sir Henry Heyman Knight and Baronet. "Sir Arthur Ingram Knight, Laurence Parsons and Sampson Stanely, Esquires. "John Rolle of Stevenston Esquire, John Wollacomb, John Yeo, Robert Dillon, Esquires, and Mr. William Nottle of Barnstable Merchant. "Henry Parker and John Branlin Esquires. "John Bodarda Esquire, Robert Wyn of Carnarvan Gentleman, William Thomas and William Stodarte Gentlemen. "For the City of Bath. "The Mayor for the Time being, John Atwood, Thomas Burford, John Big, Matthew Clift, Aldermen, John Parker and John Pierce Gentlemen. "Provided, That the Proportions of Rates set upon the several Counties in this Ordinance expressed shall not be drawn into Precedent for the Time to come; any Thing in this Ordinance to the contrary notwithstanding. "Provided, That the Town of Lyn, in Norfolk, pay no more than according to that Proportion which the Committee of Lords and Commons for the Eastern Association ordered that Town should pay, as by their Order of the Twentieth of November, 1645. "Ordered, by the Commons assembled in Parliament, That this Ordinance be forthwith printed and published. House adjourned till 10a Tuesday Morning next. 5. This Marginal Note is in the Original. 6. These Marginal Notes are in the Original. 8. This Marginal Note is in the Original. 11. This Ordinance is printed, and bound in with the Original.